I have a couple friends who love the My Little Pony cartoon. There’s something about its characters, the lessons, and the stories that get them excited. Might even be the fandom. They were pretty sure that I wasn’t ever going to make a MLP based dessert, but hey! Here we are now. Whether your a kid, brony, pegasister, or a pie aficionado, we can all agree that the best sign of friendship is the exchange of hot and crispy fruit pies, and none are better to eat during Autumn than apple pie. Apple pie is often seen as seen as the pinnacle of American confection (despite its European roots), and the keystone of of the family dinner table. 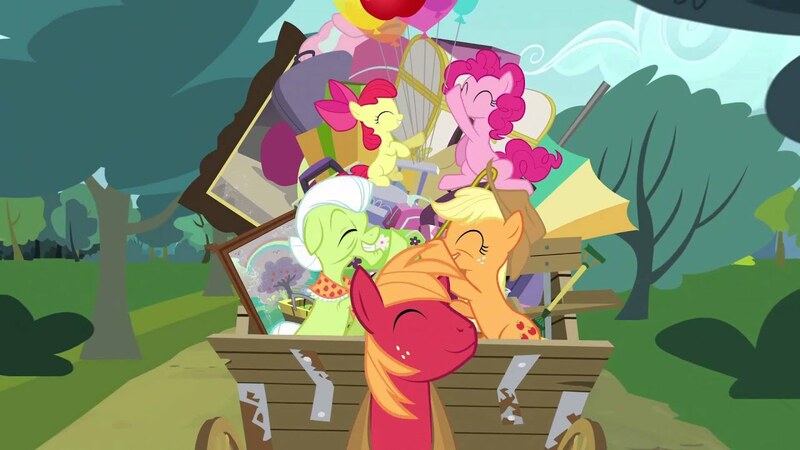 It’s no wonder the Apple Family from Hasbro’s My Little Pony are so close. Or maybe it’s their propensity for sing-a-longs. I’m not saying that apple pie will bring your family closer, but it is a sign of honest love that you care, because heck, making pie is tiresome and tough work. So let’s get to it! Start off by throwing your oven to 375˚F. It’s not 350˚F this week! Woo! Celebrate the little things because this is a bit of a grind of a recipe. Easiest part to do first is to make our dough. Throw your flour and baking powder into a mixing bowl and mix to blend the powders. Toss in the water then butter, bits at a time, while mixing, until you have a solid dough ball with no powder remaining. Set aside in the fridge, and let it chill out until we start making the crust. Slice all your apples into slivers. You can keep the skin on or not, doesn’t really matter. I personally like the skin on because that’s where the vitamins reside. Fruit flesh is mostly sugar otherwise. But that’s a biology lesson for another day. Back to baking! Set aside the apples and walnuts into a bowl for when you pour the pie syrup atop it. The pie syrup is a combination of the coconut sugar, brown sugar, rice flour, egg, maple syrup, and cinnamon. Combine all the components together and stir until it looks like a syrup and pour it on top of the apples and walnuts, once again mixing to coat them. The most difficult part, in my opinion, is making the pie shell. After you take the pie dough out of the fridge, split it into two balls, flour your rolling pin or hands and roll out the both dough balls into circles larger than your tart/pie tin. Place the bottom crust into the pan, pushing the dough into the form to make sure that it conforms to the pie shape we desire! Pour in the apples and walnuts and spread them out, taking care to fill any large gaps. Now for the top crust, you can either take the second dough ball, roll it out into another circle, and place it like a cover over the pie (if you do this, slice 6 vents into the dough for heat to escape) or you can make a lattice like I have done below. If you’re trying to impress your significant other or their parents, go lattice, because everyone is impressed by a lattice. If its for your kids, neighbors, or office party, go the easier route. For a finishing touch, I made an apple out of the leftover dough from the lattice to serve as a pie topper. I kind of love that little touch that brought it back home to the fandom that this post is for. After you made your pie topper, brush milk or egg white on the dough to aide it in browning. Toss in the oven for 20 minutes covered with tin foil then 20 minutes without tin foil. Tah dah! You have now made one awesome, applejacked up pie! Now if you’re not a fan of My Little Pony, that’s fine, it’s still a great pie, but I also have a pumpkin pie coming up that’s marvelous. The fandom its for? Well I just left you a clue for that too. Till next time!